Claire lives in Gloucestershire with her husband, daughter and step-son. She has an established picture framing business, specializing in frame restoration and gilding. 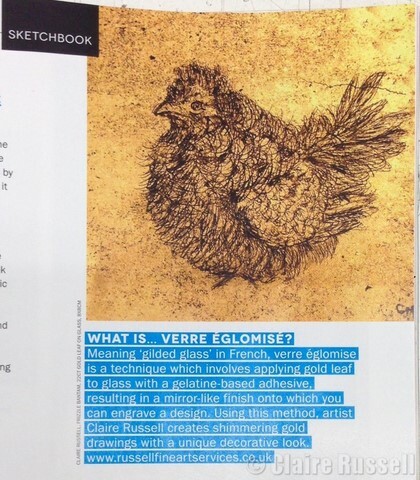 She uses her extensive knowledge of gilding and an abundance of glass off cuts to create her Verre Églomisé pieces, combining her life-long love of drawing and art education, which include an Art and Design Diploma and a Degree in Design. 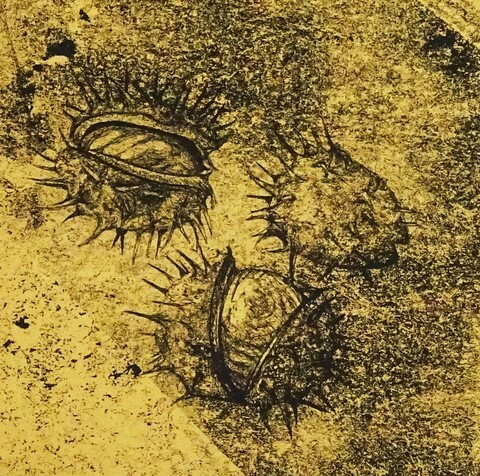 Gold leaf is 8x8cm and expensive, which is why Claire choses to draw her subjects in miniature. 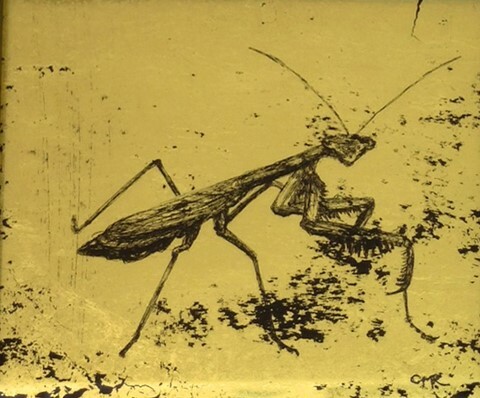 Her insipiration predominantly comes from the natural world, as she has always had a fascination with insects, birds, reptiles, tree and plant life. Her miniature work was awarded in 2015 and 2016 at the Royal Society of Miniature Painters, Sculptors and Gravers exhibition in London with the 'Gold Memorial Bowl Honourable Mention'. 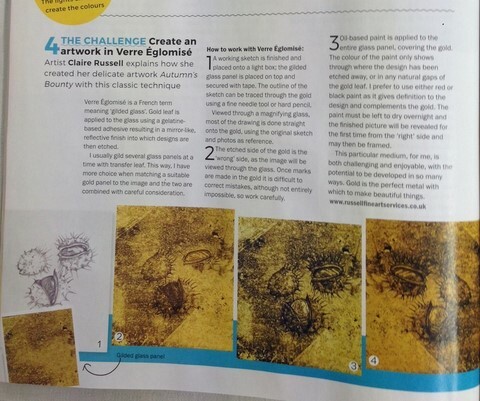 She was also elected as an Associate member (ARMS) in 2016 and had two articles published in the summer and autumn editions of Artists & Illustrators magazine. 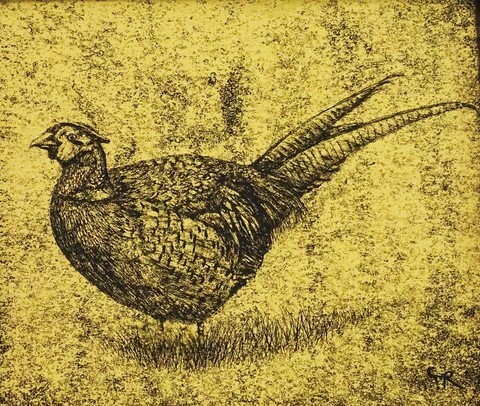 In 2017, Claire exhibited and sold works at the Royal West of England Academy (RWA) Bristol in the Autumn exhibition and the bi annual ‘Drawn’ exhibition. Also exhibiting work with the Miniature Painters, Sculptors and Gravers Society of Washington DC (MPSGS). 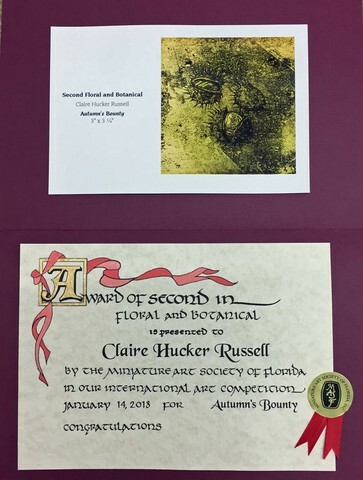 In 2018 Claire became a member of the Miniature Art Society of Florida (MASF) receiving an award for her Botanical work ‘Autumn’s Bounty’. 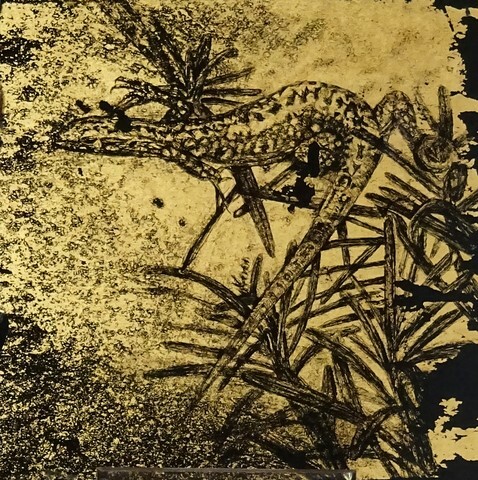 She also exhibited and sold work at the Hilliard Society in Somerset and The Snow Goose Gallery in Pennsylvania, USA. Claire has also been honoured this year by being elected as a full member of the Royal Miniature Society (RMS) a year early. 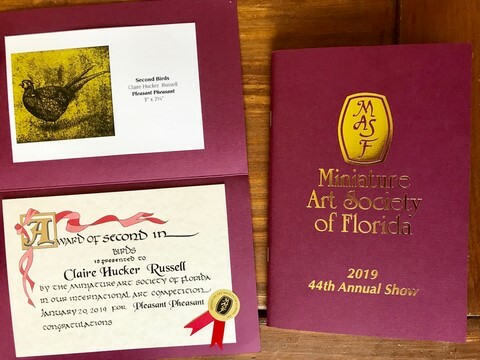 For the 2019 Miniature Art Society of Florida exhibtion Claire's work ‘Pleasant Pheasant' has received an award in the Bird category. In May 2018 Claire and four others had the honour of attending the 70th Birthday of HRH The Prince of Wales in the beautiful grounds of Buckingham palace. 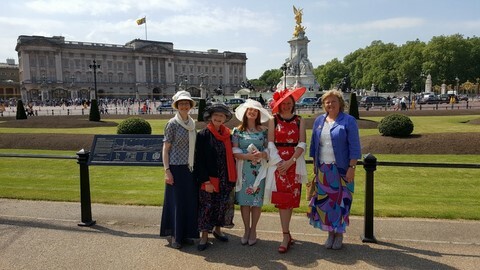 Based on continuing contribution and commitment to the Royal Miniature Society, Mrs Claire Hucker (Russell), Miss Rosalind Pierson, Mrs Marian Tumelty, Miss Helen White and Mrs Jenny Walbank (Musker) attended.